Today was another brisk fall day. Sunny and fairly warm for a while this afternoon and as long as you weren’t in the wind is was quite nice. In the wind, not so much. It was nice to sleep in FRED again last night. Love being in our home on wheels. We and Nancy headed back to assisted living this morning where Mama Ruby wanted us to work on a puzzle that some of the residents have been working on the past few weeks. 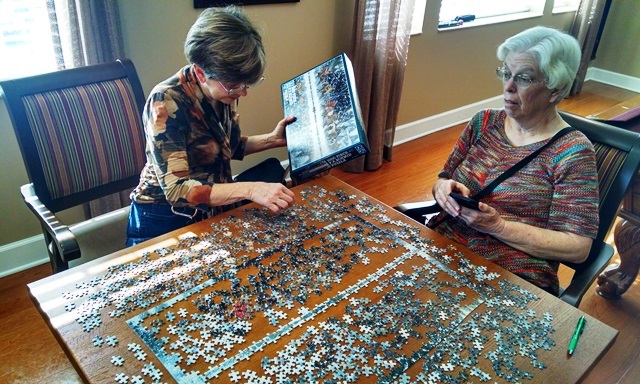 It is a 1000 piece puzzle with little color contrast that they have been having a hard time working. We worked on the puzzle and visited until the therapist arrived and Mama Ruby had to go to therapy. The three of us remained and continued to work on the puzzle and Max played a little pool since the pool table was just a few steps away from the puzzle table. After therapy and lunch Mama Ruby rejoined us until time for her skilled nursing visit. She and Anne continued to visit, took care of the nursing visit and then it was time for us to go have lunch. After lunch and a quick return to Aldi for some last minute additions to our Thanksgiving menu, it was back to Mama Ruby’s house to begin the cooking. The rest of the day was spent cooking pies, and cornbread, putting a few Thanksgiving decorations out, and making other preparations for our Thanksgiving celebration tomorrow. Jim arrived from Atlanta shortly before 9:00 after a long hard drive in horrible traffic. Thank you God for his safe travel. Hope everybody has a wonderful Thanksgiving Day tomorrow. Stay safe and enjoy your time with family and friends. We are thankful to God for all of the family and friends that follow along on our journey, while we are RVing with a purpose. Thanks for your interest, concern, encouragement and prayers this past year.